CPS reveals that the only ingredients in its chicken nuggets are...chicken nuggets! Almost all the meals served in the Chicago Public Schools are paid for with your tax dollars. But if you want to know what’s actually in those meals, good luck. Early last month WBEZ filed a Freedom of Information Act request for data on what CPS students were eating. On Tuesday, WBEZ finally received an answer, if you can call it that. What follows is the district’s verbatim response to our FOIA request for the “ingredient lists for the top five entrees in the CPS food service program." Yes, you read it correctly: The complete ingredient list for CPS chicken nuggets is two words: “chicken nuggets.” And it took more than a month for CPS Nutrition Support Services to figure this out. 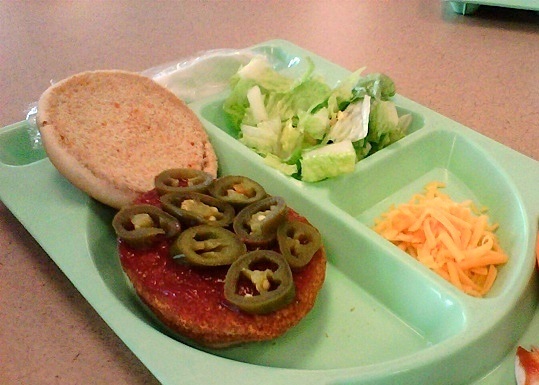 When I last did a story on popular CPS lunch items for the Chicago Tribune in 2011, the district’s spicy chicken patty contained dozens of ingredients, many too hard to pronounce. But, miraculously, CPS and its new caterer Aramark have pared the district’s number one food item down to just two ingredients: a chicken patty and a bun, according to the district’s response. A few years ago, the advocacy group Real Food For Kids criticized the 26-ingredient burger served in American schools and called on districts to phase out such heavily processed foods in lunch programs. According to the ingredient lists WBEZ received from the district, CPS has bested the 26-ingredient burger by 23 ingredients, by listing only three in its burger: a bun, a patty and (if it’s a cheeseburger) American cheese. Is this an accurate picture of CPS entree ingredients? We can’t tell. Because, although WBEZ responded almost immediately with emails and phone calls seeking an explanation for these limited ingredient lists, the district has, as of yet, offered none. Yesterday, one district representative said he would try to contact the head of school food, Leslie Fowler, to determine what happened. But we’ve heard nothing back since then. I have covered CPS food for at least five years now, and have met with my share of district resistance to sharing information. But this latest development shocked even me. At least previous administrations were willing to share details on what our tax dollars were buying for school lunch. This one, however, seems bent on keeping the public in the dark. But why? It should be noted that CPS’s response arrived on April 1st. One can only hope this mockery of the Freedom of Information Act was all just some kind of joke. We will keep you updated on CPS’s response here. UPDATE: A CPS representative said Friday he would try to obtain the missing information, but would not say when. On Monday the district had still not produced the missing data, and WBEZ filed a request with the Illinois Attorney General&apos;s office to review the situation and assist in releasing the ingredient information. Here are the complete ingredient lists that CPS finally turned over after state law enforcement got involved in the case. April 8, 2014, UPDATE: Last week, a Chicago Public Schools spokesman told WBEZ that the district simply didn&apos;t "know the ingredients" of the processed chicken products that it serves Chicago children. Yesterday, that same spokesman still would not share the information, saying that the district is "still in the process of completing this request." Today Aramark headquarters says that it gave the information to CPS "last week" but it could not share the ingredient information with WBEZ because "the District would need to release it to the media, not us." April 10, 2014, UPDATE: Thursday WBEZ heard from Illinois&apos; Assistant Attorney General for Public Access Tim O&apos;Brien. He&apos;s been assigned to review the legality of CPS&apos;s response to WBEZ&apos;s Freedom of Information Act request for school food data. Wednesday WBEZ was contacted by a company that creates online school menus for the St Paul school district. In these schools, parents and reporters don&apos;t need to file FOIA&apos;s to find out what&apos;s in the food, nor do they need to enlist the help of the Attorney General&apos;s office. They simply put their cursor on the item and the ingredients and nutritional information emerge in a pop-up window. April 11, 2014 UPDATE: CPS finally produces the ingredient lists for the Top 5 entrees. Each chicken product contains dozens of ingredients.